Underground and fortified facilities act as crucial lifelines, saving patients, preserving donor-funded equipment, and providing a sense of security for health workers, preventing further displacement. Saving Lives Underground, released by SAMS, The Syria Campaign and 12 other leading Syrian medical organizations, explains how fortifying hospitals is one of the most effective ways of protecting Syrian medics, calling on donor governments to allocate funding for these hospitals. Read about the critical impact of underground hospitals in Saving Lives Underground. April 2017 particularly deadly month for health care in Syria: there were 25 attacks on medical facilities – an average of one attack every 29 hours. Since the start of the conflict, at least 814 health workers have been killed in 454 attacks on health facilities. Syrian health workers and patients urgently need support from the international community for protective measures. Underground hospitals are much safer, proven to protect medical staff compared to above-ground facilities. 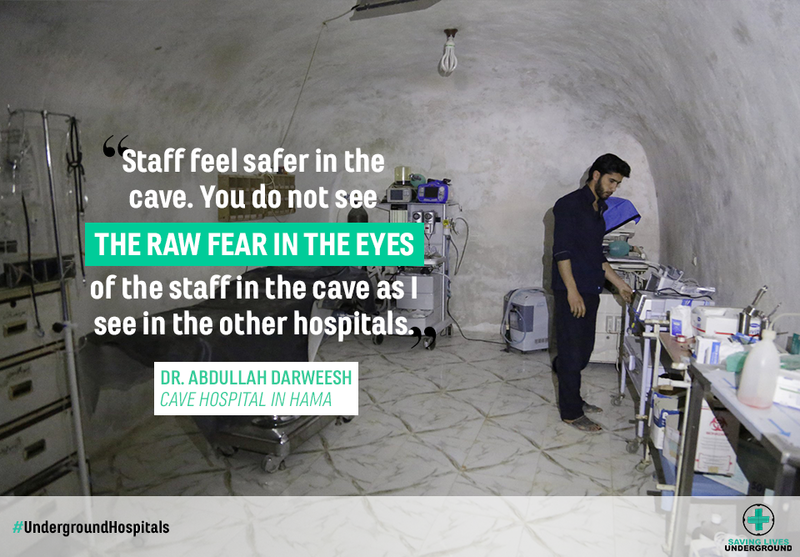 Fortification and underground construction represents the #1 donor demand of Syrian health workers. Three major models of underground hospitals have been developed – basement hospitals, cave hospitals, and fully underground hospitals. The need for protection is immense; 50% of hospitals outside of government-held areas in Syria have no measure of reinforcement or fortification. Protection is cost effective; it costs only $719,000 to fortify the existing priority facilities identified as priorities in the Idlib governorate.